The President made the call at the 12th graduation ceremony of the Ghana Institute of Journalism (GIJ) in Accra yesterday. It was on the theme: “Strengthening Media Literacy and Communication Excellence in Ghana”. 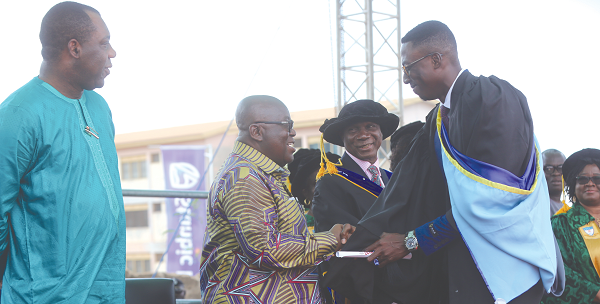 The GIJ is the premier journalism institute in West Africa and this year’s graduation ceremony was its first at its uncompleted new campus at Dzorwulu in Accra. President Akufo-Addo pointed out that the media were faced with a deliberate campaign by some elements in the democratic space to misinform and the inadvertent misinformation by media practitioners in their desire to be the first to break the news, as well as have juicy and punchy headlines. “There is an inadvertent misinformation by the mainstream media when facts were twisted,” he stated, adding that even when the truth emerged, the mainstream media always failed to publish the facts and rather swept the matter under the carpet and moved on to other issues.